Polymer clays were first developed to address wartime shortages of materials used in doll making. Kathe Kruse designed dolls and ran a very well known manufacturing company in Germany,and was in possession of a sample of self hardening plastic modeling material (no mixed chemical catalyst needed). The names of those who brought it to her attention have not been passed down. She did not find it suitable for her purposes, but turned it over to her daughter, whose nickname was “Fifi”. This enterprising young woman worked with it and made miniatures and artistic items. In the 1960’s the Kruse family sold the rights to Eberhardt-Faber who marketed it as “FiMo”which stood for a shortened version of “Fifi Mosaic” or “Fifi Modelermasse” depending on whose version of the story you hear. Bakelite, an earlier form of plastic used in jewelry, buttons and many industrial and consumer items, had been in use for half a century, but it was a phenol based product. Bakelite was a HUGE hit with designers of all sorts–everything from radios and clocks and parts and knobs for cars, to jewelry, purses and buttons. They even had kits for home use but these were a bit problematic–Much care had to be taken with it, as it was quite flammable during the production process. The polymer clays we know today are chemically different, no longer made with a phenol base, nonflammable, and are much safer for home use. 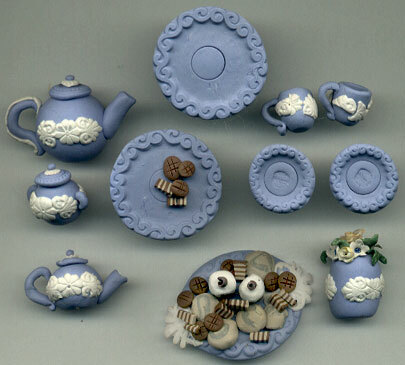 Miniaturists have known about polymer clays for a long time, and this medium is more popular than ever with those who collect dolls, doll houses, and their miniature furnishings. Here are a few tea sets and items that are made in the 1′ = 2″ scale, or 1/6 scale which also known as “11 1/2 inch fashion doll scale”. 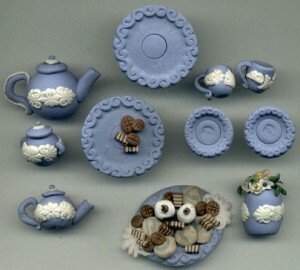 Shown at left are three different teapots, one with raised decorations, and two with slices of millefiore canes to imitate painted china. Polymer lends itself well to miniature furnishing details and accessories, and can easily mimic gilt, wood, stone, and so many other things, including food! 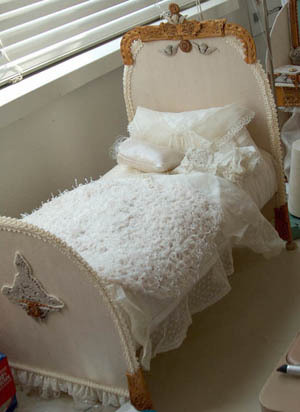 Here’s a picture of a piece from miniature bedroom set that I made. Click here to see more about the bed and miniature dresser set. I’ve also created a PDF tutorial for making the vanity set seen below. I love making these, particularly the little makeup and perfume bottles. 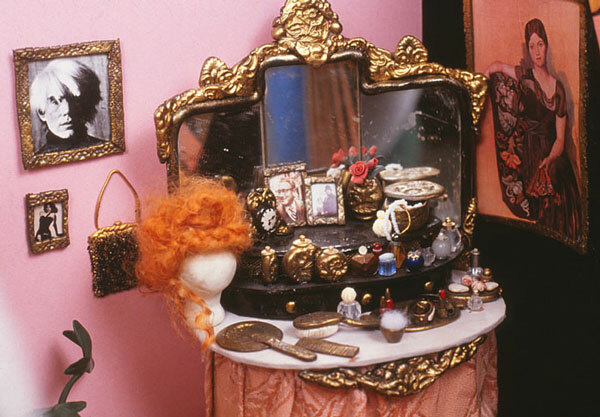 Below them is a peek at Madame’s Boudoir with her vanity set. She and her Shady Ladies are also in the same fashion doll scale. I find it much easier to work in than true dollhouse scale, which is 1’=1″ or 1/12. Click here to see a miniature Quilt Shop called “Pieces” made in the fashion doll scale. It measures 2 foot by four foot and is also made using polymer clay for all sorts of things, from the floor tiles to the plants–even the bolts of fabric are made from polymer clay, and there are hundreds of them!! There’s a slideshow with all the bolts as well. Here’s Madame’s Parlor too–I used polymer clay and fabric plus some paper and matt board to create most everything in the scene. (The cherub were Christmas ornaments before they became statues). The photos of Madame’s rooms are by Bob Grieser. It can sometimes be difficult to decide just how big or small something should be to fit in a particular scale…and I would rather do art than math…so I’ve created a handy reference chart so I only need figure it out once! Now you can use it too. Just look up the full scale size of something using the red numbers on the left of the chart, and look to find what it would be in four different popular doll and miniature scales by reading to the right . 1′-1″ means that one foot in real life would be 1 inch in this scale. This is also known as “doll house scale” or 1/12 scale. In determining into which scale a particular doll fits, one must obviously begin with whether the doll represents an adult, adolescent, child, or baby. The average sizes for a human female are (very roughly) between 5 and 6 ‘ tall, for an adult–between 4 and 5 ‘ tall for an adolescent–between 3 and 4 ‘ tall for a child– and 2 1/2 ‘ or less for babies. Using the Scale Conversion Chart, you can take the size of your doll and determine its scale. So, if you have an adult doll between 10 and 12 inches tall, the doll is in 1 foot=2 inch scale, also written as (1′-2″ scale). An adult female doll measuring between 15 and 18 inches would be in 1′-3″ scale, and an adult doll between 20 and 24 inches would be in 1′-4″ scale. “Doll House Scale” refers to 1′-1″ scale, and things in this scale (and smaller!) 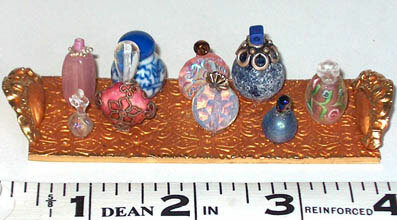 are considered by collectors to be true “miniatures”. In this 1′-1″ scale, an adult doll would be between 5 and 6 inches tall. Once you have figured the scale of your doll, you can use the chart to figure measurements for furniture and accessories. Using an 11 1/2 inch popular Fashion Doll in our example, we can see that a dinner plate that measures 10″ across in full size would be 1 2/3″ across in 1′-2″ scale. For easier manufacture, you can round up or down a little, and make the plate around 2 inches wide. 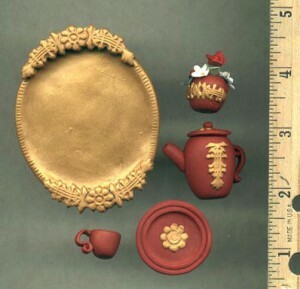 The same plate for a 15″ child doll (1′-3″ scale) would be 2 1/2 inches across.